Americans’ utilization of a wide array of payments options, and their demand for others, is driving innovation in the payments category. 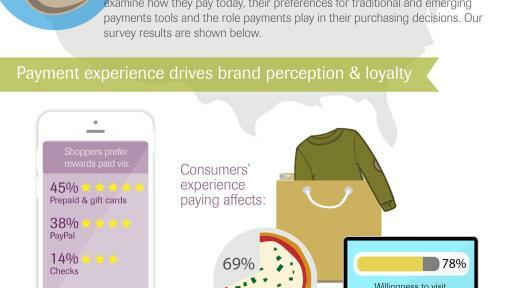 Additionally, the payment process while shopping has become increasingly important, now ultimately influencing consumers’ perceptions of and loyalty to a brand. 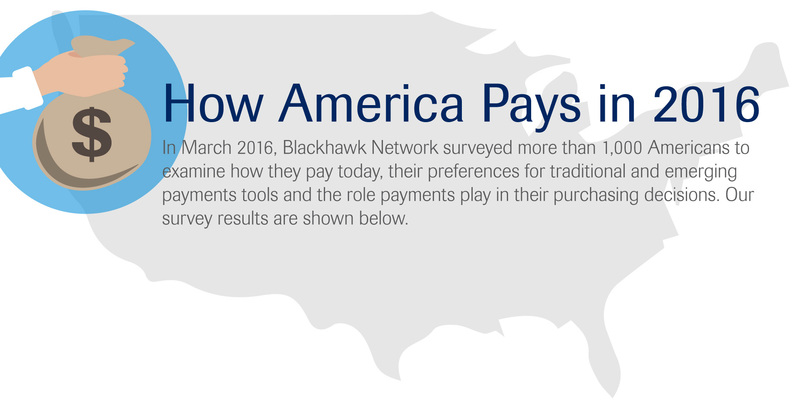 This, along with the year’s most used payments tools, was revealed today in a new research study from Blackhawk Network. 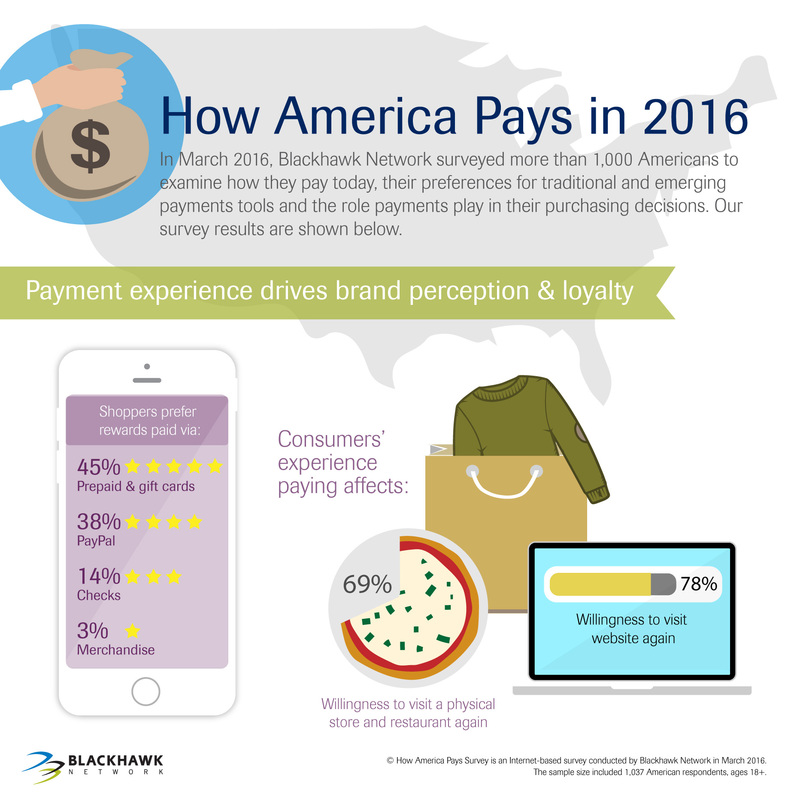 The research, “How America Pays in 2016,” surveyed more than 1,000 Americans in March 2016 to examine how they pay today, their preferences for traditional and emerging payments tools and the role payments play in their purchasing decisions. An infographic detailing the payments research can be viewed here. Brand perception and loyalty is directly related to payment experience: More than three quarters of the consumers surveyed (78 percent) report that their experience paying affects their overall perception of a website, and willingness to visit it again. Sixty-nine percent report their experience paying affects their perceptions of a store or restaurant and their willingness to go back. 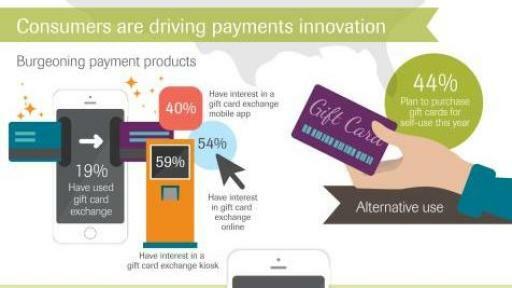 Consumers drive payments innovation: By spurring the creation of new payments technologies, finding alternative applications for existing payments tools or embracing a wide array of burgeoning payments products, consumers are inciting significant innovation in payments. For example, 19 percent of consumers have now used a gift card exchange—a tool born directly out of consumer demand. Six percent of smartphone owners now use peer-to-peer payments—a novel technology that provides a quick and inexpensive alternative to money transfers or checks. Additionally, 44 percent of consumers plan to purchase gift cards for self-use this year—a trend that retailers and marketers are now seizing on. Roles of checks, cash declining: Eighty-seven percent of Americans used cash to pay in the last year, down from 93 percent the year before. Consumers are primarily using cash for purchases of $20 or less. Check usage is also declining; 60 percent of Americans used checks in the last year, versus 68 percent the year before. The primary circumstances in which people use checks are to pay bills (23 percent) and pay other individuals (18 percent). 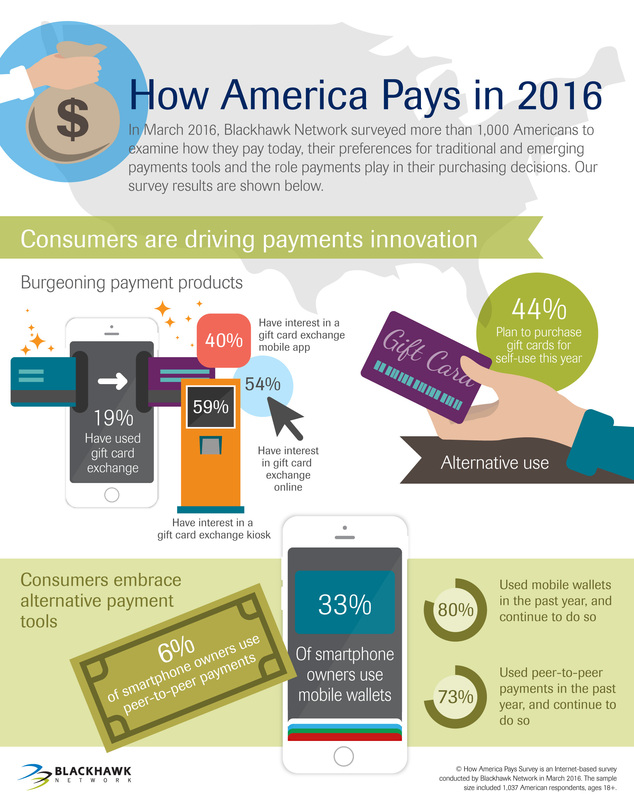 Consumers have embraced alternative payments tools: Mobile wallet adoption is up eight percent over last year. Of consumers who have used mobile wallets and peer-to-peer payments, 80 percent report they are using mobile wallets the same amount or more than they did last year, and 73 percent are using peer-to-peer payments the same amount or more than they did last year. Adoption of these payments methods among smartphone owners is also significant: 33 percent have a mobile wallet and six percent use peer-to-peer payments. Millennials go modern: This demographic, often coveted by retailers and marketers, have specific preferences when it comes to payment tools. Not surprisingly, millennials use newer payments methods at a higher rate than the general population, including mobile wallets and peer-to-peer payments, and they use cash slightly less. Shoppers’ love for gift cards remains: While other payments tools wax and wane in popularity, gift cards have remained popular for many years. Retailers should not take this revenue stream for granted. Eighty-four percent of shoppers plan to purchase more or the same amount of gift cards this year as they did last year. And 74 percent of consumers hope to receive gift cards this year. Additionally, 57 percent of shoppers have unused gift cards and egifts right now, and more than half of shoppers would be interested in using a gift card exchange that is online or an in-store kiosk and 40 percent would be interested in a mobile app gift card exchange. Consumers have payment preferences for their rewards: When it comes to promotional and loyalty rewards paid to consumers by the stores where they shop or by the service providers they use, shoppers prefer prepaid debit cards and gift cards (45 percent) and PayPal (38 percent), over other payment options like checks or merchandise. 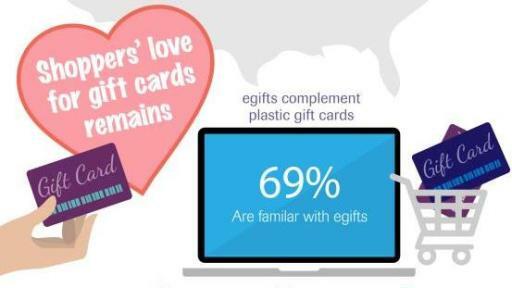 eCodes and egifts are complements to physical products: A full 69 percent of consumers are now familiar with ecodes and egifts (digital gift cards delivered to recipients via email, social media or text message and discounted ecodes that can be purchased from sites like Groupon). 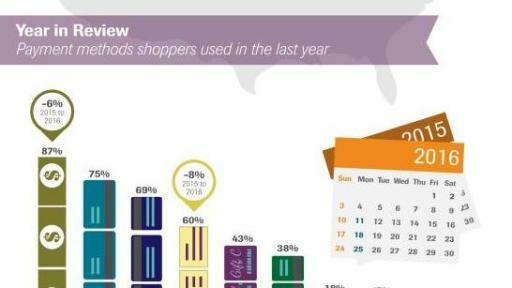 More than half of consumers have purchased ecodes or egifts and plan to do so again this year. With adoption of plastic gift cards remaining high as well, it is evident that ecodes and egifts will remain a complement—not replacement for—traditional gift cards. 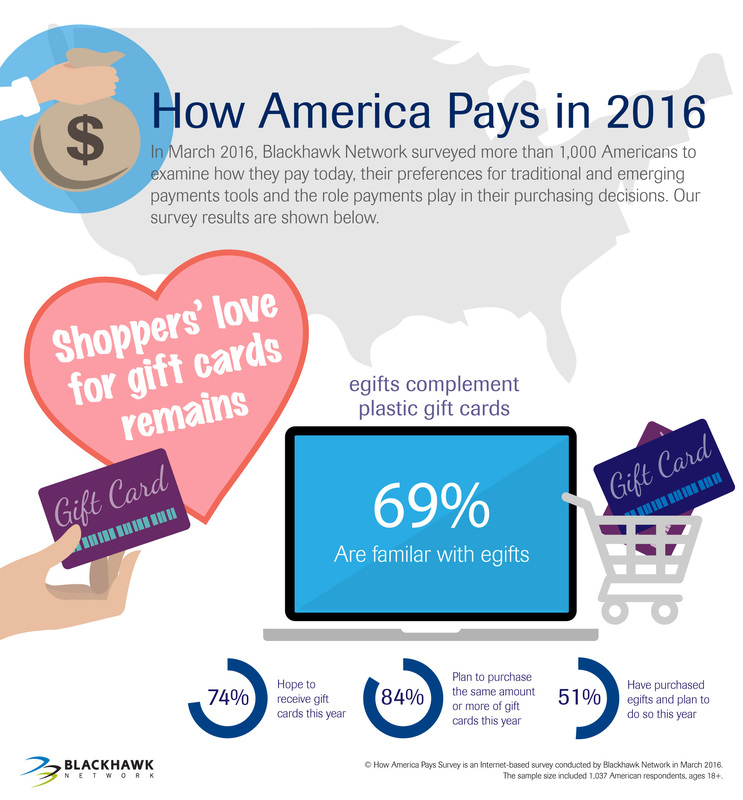 Blackhawk Network built its business on pioneering new branded payments products and solutions that shoppers love and widely adopt such as merchant-specific cards, prepaid debit cards and egifts. This success is rooted in Blackhawk’s expertise in shopper marketing and dedication to industry leading research on shopper behaviors and emerging trends. 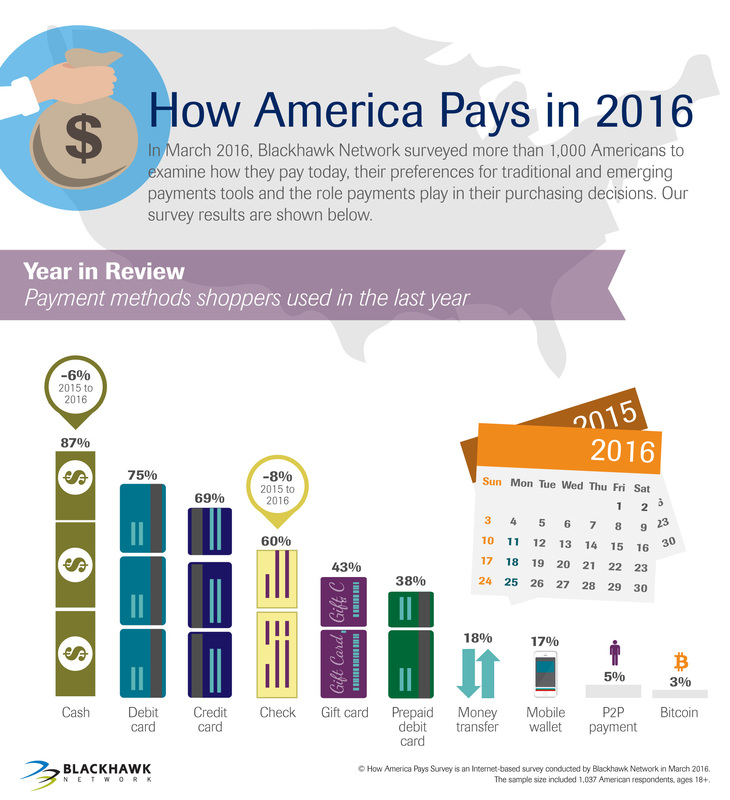 How America Pays is an Internet-based survey conducted by Blackhawk Network in March 2016. The sample size included 1,037 American respondents, ages 18+.